As a counselor, I work with many young professionals who commute daily. Whether it's taking the Minneapolis - St. Paul light-rail, driving in rush hour traffic, or walking to the office, millennials are spending a lot of time commuting. It can be a source of frustration- a sense of wasted time. But it doesn't have to be that way! It could be a chance to practice putting yourself in the driver's seat (ahem, pun intended) of life and take control of your day. 1. Happier This is the podcast I look forward most to each week! Author Gretchen Rubin and writer/producer (and Gretchen's sister!) Elizabeth Craft spend each episode talking through different aspects of good habits and happiness. They give tangible ideas on how to make your life happier. I love that each episodes ends with a reminder of the life-hacks from that episode and a challenge to try it at home. 2. This American Life A classic, with good reason. The content always varies, but each episode has a topic with one or several stories on that topic. What's really great about this one is that because it's so popular, it's easy to find someone at work to chat about it right away. I'm always leaving TAL feeling better or at least more connected to the goings-on in our country. 3. Eliza Starting at 16 I'm far from 16... and in all fairness, Eliza is now 18. BUT. I'm super into this podcast for a few reasons. First of all- I work with a lot of teens and it's fun to hear teen perspectives on current events. Second, Eliza is so articulate and certainly more mature than I was at her age- awesome to listen to her thought process through each episode. Sidenote, Eliza happens to be the daughter of Gretchen Rubin from Happier! 4. Gilmore Guys I used to have a pretty long commute, about 40 minutes one way. This was my favorite podcast to listen to each day- the episodes range from 2-5 hours (no kidding) and they were putting out two episodes per week! It was a lovely, lighthearted accompaniment to and from work. They do a deep dive into every episode of Gilmore Girls- I recommend this one for anyone needing a good laugh after a stressful day at work. 5. Call Your Girlfriend This is a pretty self-explanatory podcast- two long distance girlfriends talk about various topics each episode. As I mentioned in a previous post, it can be hard to keep up with long distance friends after college. I recommend listening to this with one your friends in another city- not only will it help your commute seem more manageable, it'll give you the warm fuzzies in knowing that your long distance gal pal is listening too. Podcasts are great, but they are certainly no substitution for quality mental healthcare. Counseling can help you identify and remove blocks that are getting in the way of your dream life. Schedule your first appointment to get started today. Last month, I scaled back my use of technology. I wanted to create my own version of a digital detox- and it was more lovely, energizing, and happiness-boosting than I anticipated! The goal was to stay present and enjoy all the holiday season had to offer. And so, on the evening of November 30, I deleted every social media app from my phone. I installed Cold Turkey on my computer, which blocked social media websites as well as other sites I find to be distracting- Buzzfeed, CNN, etc. I also decided to be very intentional on what I'd be watching on Netflix- I wasn't looking to cut it out completely (I LOVE watching Christmas movies throughout December) but mindlessly watching The Office for the 10th time was something that needed to change. December 1 was a Thursday. My typical Thursday morning consisted of coffee and watching the news, while scrolling through social media, personal emails, and work emails, and then getting ready for to head into the office. But on December 1, I woke up, made coffee, and sat on my couch. In silence. While my phone was in a different room. For a full 20 minutes. Honestly, I had no idea how attached I was to my phone. Obviously it was somewhere on my radar, otherwise the digital detox wouldn't have been needed. However- I was shocked just how dependent I felt on it during that first morning. That 20 minutes felt like an hour. I stared at the television remote for awhile, trying to avoid turning on the morning news. My phone was in another room and my mind automatically thought about all the things I could be doing on it instead of sitting in silence. It was a rough morning! But it got so much better- by the end of the first day, I felt like a new human being. It truly felt like I was discovering a whole new, non-tech, natural world. I moved slower throughout my day, felt less rushed, and was more productive both at home and at work. The drastic change was a bit unsettling. The best part about all of this is that it lasted through the entire month of December- goal accomplished! My husband commented on how strange it was to see me reading on the couch with my phone nowhere near me. I was able to get so much reading done without any digital distractions. Life seemed so much richer! Instead of all that screen time, I got to focus on the natural beauty of life and the world around me. As cheesy as that sounds, it's completely true. Time moved slower, and I was able to soak the sights, sounds, and smells of Christmas and the New Year- which was precisely my goal. I did miss seeing pictures of family and friends- especially all their fun holiday adventures. Mornings were SO much more calm! It was a lovely way to ease into the day, instead of rushing into technology and my to-do list. I also completed the Advent devotional reading that was part of my original plan! I noticed just how much my mood could be impacted by technology. Whether it was reading emails first thing in the morning or right before bed, watching the news, mindlessly binge watching something on Netflix, or scrolling through Instagram... all of it led me to feel tired, drained, and unmotivated. I learned what makes me feel good- having a clean home, starting my day intentionally, savoring a great cup of coffee, finishing books (seriously, having stacks of half-read books drives me up the wall! ), having conversations without my phone in my hand. I deleted my personal Twitter- I'm exclusively using this counseling account now. No Facebook app on my phone, plus I've done a lot of unfollowing. That way, I'm only seeing posts from close friends and family. Less distraction from cute animal pictures and cooking videos! I unfollowed a ton of meme accounts and celebrities on Snapchat and Instagram. Turns out, I don't need to know what Chrissy Teigen is up to on a daily basis. One that is a work in progress... no phone until coffee, morning devotional, and workout are all complete! This is tough- but necessary for the right mindset each day. I hope this experience will encourage YOU to try whatever version of a detox works. At the end of your detox, you might notice a few things coming up. This is to be expected, because we often use technology and social media to mask our true emotions and issues. Processing through these things with a counselor can be healing and transformative. Schedule your first appointment to get started today. 'Tis the season for a technology detox! I want to be fully present for the next 31 days- present to myself, my clients, my family, my friends, and present to the holiday season. Celebrating Christmas and the New Year is important to me, and I don't want to miss out on real life experiences by being distracted. Social media and clickbait headlines are all going to take a backseat until January. 3. Complete my winter bucket list- things like going for a walk in the snow, baking cookies, sledding! Are you ready to take your first step toward growth? Counseling can help you become the person you always knew you were meant to be. Schedule your first appointment to get started today. Our culture promotes the idea of hustling, the pursuit of busy-ness, and productivity. But I have to say (and maybe this is because I'm a therapist and talk about this all the time), I've noticed people are craving a slower pace. People are noticing how working too much and resting too little really impacts their lives, relationships, and work. In the era of #girlboss, it's easy to get caught up in the idea of having it all. Excelling at work, impressing the boss, eventually becoming the boss, working on your side hustle- all while gracefully maintaining healthy relationships with friends and family. Oh, and maybe add dating to that too. It's fine. Right? Well. Maybe it's not. Each of us still only have 24 hours in the day. We have work, school, and other responsibilities that need our attention. Our minds, bodies, and souls need time to relax and just be. In my work as a counselor, I'm constantly talking with young women about the importance of self-care. And how to resist the message that self-care is selfish. And taking a second look at what it actually means to be kind to ourselves. One thing about feeling overwhelmed is that thinking clearly often goes out the window. Just when you want to do something to take care of yourself, it's hard to come up with an idea! Enter this list. I've come up with 25 things you can do to take care of yourself. Some of them will resonate with you. Other won't. And that's okay. Pick and choose what works for you. Register for a retreat- wellness, nature, spiritual, anything! Organize your closet and donate what you don't need- or like! Take a moment and find one thing on that list that sounds restorative to you. Now find (or make) time in your schedule to make it happen. Scheduling something increases the chances you'll actually make it happen- something Gretchen Rubin talks about on her podcast, Happier (and presumably in her books, which I have not yet read). Scheduling is a strategy to use when creating habits- and in order for self-care to become a regular part of your life, it may need to become a habit. Whether you use a calendar on your phone or a paper calendar, be intentional about scheduling self-care. Make an appointment with yourself sometime this week- and don't cancel! Counseling is an investment in current and future self. If you're tired of your 20s being consumed with worry and fear, I want you to know there is hope. It does not have to be like that. It can feel so frustrating to see anxiety call the shots in your life. When you're ready to make a change, schedule your first counseling appointment. As I've mentioned before, it's important to continue the work of personal growth in between counseling sessions. This can look different for everyone- what works for someone else may or may not work for you. The important thing is to stay engaged and focused on your goals! What it is: Calm is a mindfulness meditation app- and offers SO much for anyone wanting to begin or deepen their meditation practice. The free version offers a variety of timed, untimed, guided, and unguided meditations, plus a week-long introductory program called 7 Days of Calm. The app also has a ton of relaxing scenes with sounds, like Fireplace, Foggy Stream, and Pouring Rain. I like to use this feature to help me focus on important tasks. The upgraded version provides specific meditation programs with themes like sleep, anxiety, happiness, and self-esteem. It also updates each day with a new meditation. I love incorporating mindfulness and meditation into my work as a therapist, and often recommend this app to my clients! Where to start: Check out the 7 Days of Calm program. This free feature walks you through the basics of mindfulness meditation, at just 10 minutes each day. Bonus: There's a book, too! I highly recommend it as a screen-free way to get fresh ideas for relaxation, gratitude, and mindfulness. Where to start: Just download the app and get tracking! There are no extra steps needed, you don't even need to create an account. What it is: Pacifica is a comprehensive mental health app that includes mood and activity tracking, cognitive-behavioral techniques, guided visualization and meditation, and chat forums. Where to start: You'll be prompted to rate your mood when you open the app for the first time, and then you can configure your settings to get daily reminders. Once you do that, hop on over to either the relaxation section or the thoughts section. The thoughts section is a great way to practice cognitive-behavioral skills you might have learned in counseling! If you upgrade to the paid version of Pacifica, you'll have access to many more activities in the relaxation section, and you'll have the ability to keep a thought journal via text or talk-to-text, along with a few other features. Bonus: Pacifica syncs with Health for iPhone users! This is a really handy way to keep track of your health data- especially helpful considering the major connection between mind-body health. Apps are an excellent resource to use in between counseling sessions, but they are not a substitute for quality mental healthcare. You can find freedom from anxiety and perfection. To get started, schedule your first session today. As summer is coming to a close, I'm wrapping up the life after college series here on the blog. 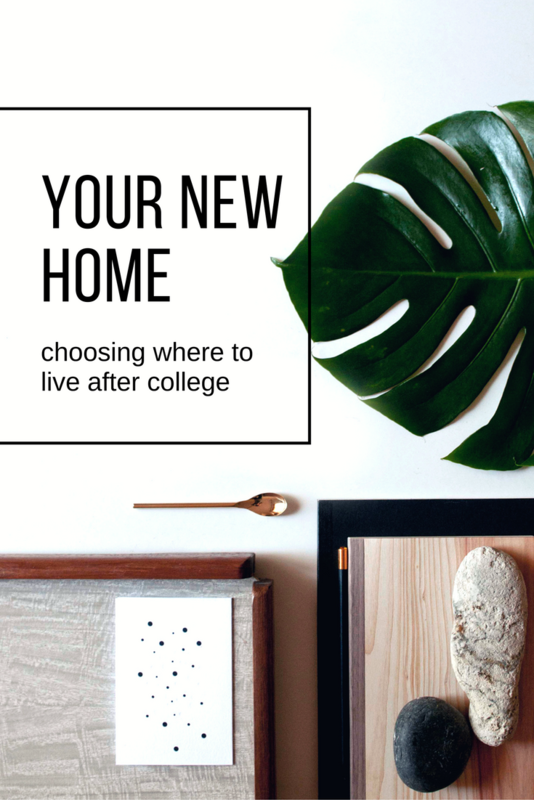 We've talked about making the transition from college to postgrad life, navigating careers, making and keeping friends as an adult, and finding the best living arrangement for you. Today's post is all about prioritizing mental health in your 20s. Now is the perfect time to travel, take time off to see the world! Put your nose to the grindstone and excel in your career! Get involved with Teach for America or AmeriCorps! Have as much fun as you can, before you have to settle down! Whew. I'm tired just thinking about it. Now, there's nothing objectively wrong with going after these things. But trying to please other people or follow a path that someone else has for your life can lead to burnout, and it can lead there fast. Plus, attending to even a few of these things can result in putting your mental health on the back burner. What's the danger there? Neglecting your mental health not only impacts your state of mind, but the state of your body, spirit, career, and relationships. So! Just how does one go about making mental health a priority? Prioritizing mental health will look different for everyone! There is no one correct way to go about it. Here are a few ideas. Take what works for you, and leave the rest. First, realize that making mental health a priority takes a certain level of intentionality. You will have to choose to put it on your to-do list. You even will have to carve out time to attend to your mental health. As nice as it would be, cultivating strong mental health doesn't just happen by accident. It might be helpful to make a mental health or self-care plan. Plan dates with yourself. Everyone needs time to herself, regardless of where she might fall on the introvert-extrovert spectrum. These self-dates can give you time to take stock of how you're really feeling. Let's say you've been working 60 hours a week for the past few months. You've hardly had time to breathe, let alone take time to recognize your emotional state. Busy-ness can be a mask for any number of things, and it's likely that when you slow down, you could become aware of just how much stress and anxiety you're feeling. Trade your phone for a good book. First of all, time away from screen is hugely beneficial. Lots of recent college grads forgo reading for pleasure and instead choose to read books that are pertinent to their career. Note: there is nothing wrong with that! However, consider the difference between reading for work and losing yourself in a juicy memoir or a cozy novel. You may even consider it to be soul care. Attend to mind-body-spirit. This 3-pronged approach to life can do wonders for helping you to feel balanced, centered, and grounded. Take stock of where you are with these, and notice if you feel unbalanced. Do you find yourself getting that workout in almost every day, but you keep pushing meditation to the bottom of your to-do list? Or maybe you're stimulating your mind constantly at work, and not allowing your body the time it needs to be exercised in whatever way is best for you. Find what balance feels right for you, and remind yourself of it regularly to keep your priorities aligned. Find a good counselor and invest in yourself. When you're looking for a counselor, there are a few things to consider. Location, cost, and availability of appointments are key. One of the most important considerations is how you feel around the counselor. Does the therapist make you feel safe, like you can tell her anything? Do you feel comfortable talking with her? Self-disclosure is a huge part of counseling, and so it's important that you feel good about confiding in your therapist. That's great, but I don't think I need counseling... I don't have big enough problems! Let's just bust this myth right now- you don't have to have "big" issues to come into therapy. In fact, you don't even need a diagnosable mental health condition (as long as you are paying for services yourself, that is). Investing in counseling means you have a space to talk about yourself and your life, to a non-judgmental and empathic person. A space to say what you want to say, even if you don't know how to say it. A space to talk- or not talk. A space to work out some things from your past. A space to discover who you truly are and develop your identity. A space to learn new skills. A space to try out a new way of being, a new way of treating yourself and others. A space to feel truly heard and understood. If you're in the Minneapolis - St. Paul area and looking for a therapist, let's connect. My therapy office is just minutes north of Minneapolis and St. Paul, off 694 and 35W in New Brighton, MN. To take the first step toward growth, schedule your first appointment today. After college, you face so many decisions. Not only are you making choices about relationships, finances, and your career, but you have to decide on where and how you will live! Emphasis on the word decide. So many recent college grads end up living somewhere out of convenience, or find themselves somewhere that was just supposed to be temporary. Making a decision, whatever it is, can be empowering. Some decisions are based on finances, some are based on relationships, and others are based simple preferences. It's also important to take your mental health into consideration. Are you someone who tends to isolate when feelings of anxiety or depression are intense? Maybe living alone wouldn't helpful. Or maybe you don't have a great relationship with your parents, but they're offering you a place to live, rent-free. Is the financial savings worth it to you? Do you feel anxiety about beginning your postgrad life, and staying at home just seems less scary? Are you choosing your home based on fear? These are all questions to ask yourself when deciding what living arrangement is best for you. No matter what you find yourself living, allow yourself some grace. Any decision you make doesn't need to last forever. If you decide after a year of living alone that you'd actually rather have roommates, make that change! If you are overwhelmed by having roomates around all the time, maybe it's time to find your own place. Whatever you choose, make sure to enter into that situation mindfully. Take the time to consider the pros and cons of each situation. According to a study by the Pew Research Center, more young people (18-34) are living with their parents, compared to any other living arrangement. Almost a third of millennials live in their parents' home, as of 2014. Half that number live alone or with roommates. It is a common social trend to move back in with your parents after college- but that doesn't mean it's easy! Enter this arrangement intentionally, instead of sliding into it as a default. If you and your parents are on the same page regarding expectations (will you be paying rent? will you be contributing to groceries? should they expect you for dinner? ), the transition back home is more likely to be smooth. Understand that this is a transition for everyone. It's not unlikely that your parents still think of you as the younger version of yourself- maybe 17 or 18, when you last lived at home full time. It'll be important to show them how you've grown since then. This might mean adjusting your lifestyle a bit. If everyone is on the same page, this can be a very sweet time for all of you. In an individualistic culture like ours, living alone can become some sort of holy grail. If it sounds like exactly what you're looking for, take some time to consider what it might actually be like. It could become easy to stay in most nights and get into a hermit routine. If you're more of an introvert, this probably seems like paradise! And at the same time, it's so important to maintain your relationships. As an extrovert, you might have the opposite situation. Being alone might feel uncomfortable and lonely. Be sure to attend to your social needs, even when work and life get busy. If you choose to live alone, be intentional about keeping up with friends by scheduling social events. Whether it's a weekend brunch, a weeknight yoga class or happy hour, make sure you're getting out on a regular basis. It's okay to guard your free time- schedule that in as well as your social events, and you'll feel internally and socially balanced. Transitioning from having college roommates to postgrad roommates can be a fairly seamless transition. And at the same time, there are some pretty significant differences. Even if you choose to live with the same people after college, your lives are different now by nature. Your typical college Saturday night may or may not look like your postgrad Saturday night. One isn't better than the other, but be clear with your roommates on how you want to live your life. And, allow space for your roommates to disagree. On a practical level, try upgrading a few things to make your place feel more like your postgrad life, instead of an extension of college. It's not necessary to trade in all your belongings, but by having a few new things for your postgrad life, you're signaling to yourself and your roommates that this is a transition, the beginning of something new. If life after college is turning out to be more challenging than you thought, I want you to know you're not alone. I've helped many recent college graduates find relief from anxiety and get back on their path. Schedule an appointment to get started today. If you're like a lot of recent college grads, you're feeling some (maybe a lot) of anxiety about the future. You've left the comfort and familiarity of your college campus. Maybe you're feeling anxious about being able to find that perfect job. Maybe you've landed your first job, and you're feeling nervous and overwhelmed about performing well. There's a lot of pressure to put that degree to work and get a great job in your field of choice. But hear this- the first job (or jobs) you have after college will not define the rest of your career. CNN suggests that millennials on average have 4 jobs before they turn 32. It's okay to take a job that isn't everything you'd been planning and hoping for. Maybe you'll take a job in an industry unrelated to your degree. Maybe you don't love the job, but you decide to take it because it pays well. That's totally okay! There's a cultural message right now that recent college grads should hold out for a job they love- which can be a hard message to absorb if your priorities are elsewhere. You know, if they include things like being able to pay rent. It might seem like everyone else is doing what they love. It's okay if they are, and it's okay if you aren't. It's helpful to have a general idea of what you'd like your career to look like long-term, but sometimes it can be less-than-helpful to think too far into the future. Does looking too far into the future seem to cause you anxiety? Focus on the present moment. Practice yoga, go for a run, get our your coloring book. It's okay to not have your life figured out. Having it all together isn't actually a thing. Beware the dangers of job FOMO. Picture this: your college roommate posts on social media about her brand new high-paying job, working at some swanky firm downtown. What is your first reaction? Are you irritated? Happy? Proud? Frustrated? Jealous? All of the above? Notice your reaction to other people's success. Pay attention to those feelings, especially if they lead to negative self-talk. Ultimately, you are in charge of your reactions. If you're noticing feelings of anxiety, hopelessness, or envy, consider taking a few moments just for yourself. Take a step back and ask yourself where those feelings are coming from and how you would prefer to feel. Whatever your feelings are, that's okay. It's what you do with those feelings that counts. Career Contessa: I especially love this article on post-grad anxiety. Levo: Check out this article on the stress of job-searching. Gen Y Girl: Here's a blog post about the danger of comparing yourself to others. Is anxiety sitting in the driver's seat of your career? It does NOT have to be this way. In counseling we can find ways to give anxiety a swift kick to side. If you're local to Minneapolis - St. Paul, schedule an appointment to get started today. As a counselor for young women, I often hear about the struggles of making friends after college. Recent college grads land their first jobs or move to new cities with the idea that making friends will be just the same as it was in college. When that ends up not being the case, many young women feel frustrated, lonely, and begin to doubt themselves. The traditional undergraduate experience is a great breeding ground for making friends. Research shows there are a few crucial aspects to close friendships: proximity, repeated, and unplanned interactions. Think about the experience of living in a freshman dorm. At the beginning of the year, everyone is a stranger. Most people are eager to make new friends on campus- and the conditions are perfect for that. Whether you're walking to class with your roommate, going to events and parties together, or hanging out in each other's dorms, you're spending a lot of time in close proximity with these people. Repeat this for a few years in college and many strong friendships are bound to be made! Your college friends were there for you during a special time in your life. You were witnesses to each other's milestones. You were there for each other during midterms, finals, semesters abroad, break-ups, parties, and making decisions about your futures. Nothing can truly replace that. There are good reasons your college friends are here to stay. They knew you before you had a job title, before you got married, before you started thinking about things like your 401(k) and paying off student loans. But instead of keeping those friendships rooted in the past, consider doing things together to keep your relationships fresh. If your college friends are actually local, do things together that aren't exactly what you did in college. Sign up for a wine and painting class. Go to Saturday morning yoga followed by brunch. Try learning a new language together. Start a book club- maybe over Google Hangout if your friendships are long distance. Switching it up helps bring your old friendships into your new stage of life. It's important to be intentional about your friendships. After graduation, friends scatter across the country (maybe even the world)- so much for that proximity! The distance alone makes it hard for those repeated encounters to happen- you're feeling lucky if you get to see your college girlfriends every couple of months. And if you're really spread out, there's little to no chance of unplanned interactions. In fact, it takes quite a bit of coordination to get everyone together in the first place! Strike up a conversation with someone after yoga class. It doesn't need to be anything groundbreaking, maybe even just commenting on how relaxing that flow was, or how much you like the instructor. Could this be your friendship meet cute?! Get involved in something you care about- whether it's serving at your church or volunteering with a nonprofit you're passionate about, you're bound to meet like-minded people! Meeting people who care about the same things you care about is key when making new friends. Plus, it feels pretty good to give back to your community. If your coworkers are organizing happy hour, go along! Whether or not you drink, spending time outside of the office with your new coworkers can be a great way to take your work friendships to the next level. If you can prioritize making and keeping strong friendships now, that will set the stage for life-long relationships that are enjoyable and good for your health. Research shows that people who have strong relationships are more likely to feel happier, live longer, and be less stressed. If you want to hear more about making friends after college, check out MWF seeking BFF: My yearlong search for a new best friend. The author of this memoir chronicles her experiences of making new friends after moving to a new city- I highly recommend it! It's not easy to form new relationships as an adult. If fear and anxiety are standing in the way, consider counseling. We can work together to find ways to remove the roadblocks and get back on the path YOU want for YOUR life. Anxiety doesn't have to control you. To get started, schedule an appointment today. I'm excited to share a new blog series! Over the next five weeks, I'll be talking about the ins and outs of life after college. New jobs, new living spaces, new relationships, new routines- handling all these changes can be overwhelming- even if the transitions are good. If there's anything in particular you'd like to see, let me know in the comments. The playing field is pretty level in college- everyone is taking classes and working toward the same goal- earning that degree! Things change after graduation when people start to have different goals. The important thing is to stay out of comparison. Take some time this summer and consider what you actually want out of life. Are you applying to law school because you want to, or because you think you should? Do you want to get married because everyone else is, or because you and your partner actually want to do that? It's okay to do things at your own pace- in fact, it's more than okay. Focus on your goals and stay the course. Stay in the moment and focus on yourself- as challenging as that can be. People around you are doing all sorts of things- traveling the world, starting new jobs, beginning grad school, getting engaged and starting families. It's easy to compare yourself and your life to everyone else's- especially with social media. But, remember there's no one right way to handle life after college. Are you a recent college grad in the Minneapolis - St. Paul area looking to do the important work of personal growth? Consider making an appointment for counseling. Curious what it might be like? Schedule your first appointment to get started today. Mention "seasonal depression" to someone and you could get a response like, "Yeah, winter can be a hard time for a lot of people." But actually, seasonal affective disorder can be present in the warmer months as well- in fact, about 10% of people who experience SAD report their symptoms to be during the summer. Symptoms tend to be a little different compared to winter seasonal affective disorder- people who experience summer depression might have more anxiety, insomnia, and weight loss. According to the National Institutes of Mental Health (NIMH), heat exposure is a major contributor to summer depression. The hormone prolactin appears to play a role- this hormone is stimulated by heat, and high levels of it can make you feel tired. Also, prolactin suppresses dopamine, which is a neurotransmitter involved in pleasure and happiness. Thyroid hormone is also part of the puzzle- it is suppressed by heat, and low levels of it can lead to lower energy. A summer lifestyle change can also be a factor in summer depression. Many of us try to cram so much in during these months, trying to take advantage of the sunshine and warmth. We stay out later at night and make sure to get outside be active on the weekends. We travel for family vacations, reunions, and weddings. So much travel can lead to feeling anxious and unsettled. Even with all the fun and excitement, it's no wonder so many of us feel exhausted during this season! 1. Be realistic about your summer bucket list. Pick a few things you want to do, but don't overbook yourself. It's okay to say no to parties, happy hours, family events. Staying at home can be just as fulfilling as be out and about. 2. Stop romanticizing the season. We tend to put summer on a pedestal- especially here in the Minneapolis-St. Paul area, because it's quite chilly most of the year! But putting too much pressure on yourself to have the best summer ever can lead to disappointment. 3. Be careful about spending too much time in the sun. Beach days can zap your energy and leave you feeling fatigued. Trade the sun for a movie theater, coffee shop, or museum! 4. Make a self-care plan. This might include things like taking a walk after dinner, reading that book that's been on your list, getting a pedicure, or giving yourself permission to take a nap on Saturday afternoons. You may have tried these things and have found summer depression has been lingering. Maybe you've been thinking about meeting with a counselor in the Twin Cities. If you're ready to start working through things like anxiety, self-esteem, confidence, or perfectionism, let's chat! I'd love to talk with you about how counseling can help. Schedule your first appointment to get started today. It's MAY! This is a big deal for us here in the Minneapolis area. It's true that our winters can last well into April, but it's rare to have snow in May. For those of us who don't exactly have an affinity for winter, the start of May puts a spring in our step and a sense that it is finally going to stay warm. Today it was a lovely 65 degrees, and people are walking around outside in shorts and sleeveless shirts. We really love spring here. But I digress. If you're a 20-something, there's a good chance this time of year has become synonymous with wedding season. Weekends are filled with bridal showers, bachelorette parties, and of course, actual weddings. Weddings can be absolutely delightful- from the ceremony to cocktail hour to the reception, there are old friends to catch up with and a fresh new marriage to celebrate. She looks so good after just having that baby... why can't I get my act together? She just got another promotion and I'm stuck in this dead-end job. I love this quote from Teddy Roosevelt. It's so true, isn't it? Really think about it. Has there ever been a time when you've compared yourself to someone and it resulted in joy? Either you come to the conclusion that you are somehow less than the other person, and you begin to feel bad about yourself, your life, your body, your relationship... etc. Or it's the other way around, and you decide you are somehow better than someone else. Walking around with a spirit of superiority makes it difficult to connect with others and actually be attentive to your own needs. Comparison indeed is the thief of joy. 1. Focus on the couple. If you find yourself in a comparison trap, try moving your attention to the bride and groom. Notice their joy and lightheartedness. And if you're in a group conversation that involves comparison, make the choice to steer the conversation back to the newlyweds. You cannot change other people, but you can change what you do. 2. Focus on yourself, in a positive way. Silently repeat positive affirmations. You are enough, just as you are. And, give yourself a reality check. Is it helping you to compare yourself to another person? Does it really matter what anyone else is doing? Probably not. So, focus on what you are doing. Stay in your lane. 3. Focus on your surroundings. Whether you're at a bridal shower or a wedding reception, you're probably surrounded by all sorts of beauty. Notice what you see, hear, smell, taste, and feel. Pay attention to all the details. Practice gratitude for all you are experiencing. Finally, consider where you are getting your sense of self-worth. For example, let's say you're catching up with an old friend during cocktail hour and she is telling you about the fabulous new condo she just bought. And let's say being a homeowner isn't something you can financially swing right now. If your sense of worthiness is caught up in achievement, you could start feeling envious, and less than this person. You might start to question your own financial goals, your own life, and your own SELF. When this becomes a pattern in your life, it can be helpful to work through it with a counselor. Local to Minneapolis? Ready to leave anxiety behind and start living on your own terms? Counseling can help. Schedule your first appointment to get started today. It's about that time of year again- the Minneapolis-St. Paul airport is full of college students headed south for spring break. It's midway through the semester- time to press the pause button on normal responsibilities and unplug for a week. But what happens after college? Unless your job has built-in breaks (maybe you work in education), it can be difficult to take time off early in your career. A recent study showed that almost 60% of millennials feel shame when they take a vacation. What's worse, millennials themselves admit they are the ones doing the shaming! The study also found that almost half of surveyed workers felt the need to justify using their vacation days to their boss- even though they had earned them. If you do find yourself on spring break, you're likely connected to work anyway. Research is showing that millennials are the most likely group to continue working on vacation, and they are returning to work feeling less productive. Maybe it's a fear of being perceived as unreachable (read: unreliable) by the boss and coworkers. Or perhaps young people aren't great at work-life balance after all. 1. You will be a better employee if you go on spring break. You'll be more productive and more creative after a vacation if you truly disconnect. 35% of millennials say they work every day on vacation- one could argue it's not actually a vacation if you're working every day. Consider this: most employers would probably prefer their workers to return with increased productivity and creativity, at the expense of having regular contact with them while they're away. 2. The process of planning a trip is very enjoyable. Some research has shown that the planning stage is even more pleasurable than the trip itself. Spring break trips are especially alluring to those of us in the North- it's cold almost 6 months out of the year! If you're feeling stressed at work and gloomy because of the dreary weather, consider what it might feel like to plan the details of a beach vacation. Just thinking about being in the warm sunshine can do wonders for your mood. 3. Sunshine, glorious sunshine! After months of mostly gray skies and cold temperatures, your mind and body are craving the warmth of the sun. Research shows that the brain produces more serotonin (a "feel good" chemical) when you're in the sunshine. A boost in serotonin can make you feel happier and less anxious. Perhaps just thinking about taking a vacation is anxiety-producing for you. Pay attention to those feelings. What about it is leading you to feel this way? Do you have perfectionistic tendencies that are getting in the way of taking time away? Maybe you're completely overwhelmed with work, and going away just doesn't feel feasible. Or maybe you do feel like you could get away, but financial stressors are making that difficult. If anxiety is getting in the way of your life, know that help is available. Counseling can help you feel more calm and less overwhelmed. If you're in the Minneapolis-St. Paul area and ready to take the next step, schedule an appointment today. Oftentimes it can be difficult to explain your experience of anxiety to someone else. Anxiety can feel different depending on the person. People who live with generalized anxiety have a distinct reality from people who experience social anxiety. Some people have physical symptoms, while others primarily experience anxiety mentally and emotionally. Enter these videos. These are some quick explanations of anxiety that could be helpful for you in understanding your own experiences. You can also use them as an aid when you try to explain anxiety to others. Have yourself a watch and let me know your thoughts in the comments below! Anxiety is part of life, but it doesn't have to rule your life. To start your journey toward freedom, schedule an appointment today. What's better than free Chipotle? Free Chipotle that teaches you a lesson! The other day I had some free time and a free Chipotle coupon, so I went down the street to Chipotle, ordered chicken tacos, and sat myself down at a window seat. And then I ate. That's it. No phone, no book, no laptop, no magazine. Just me and my tacos. At first it was uncomfortable. It felt unnatural to sit there and just eat. Even as a counselor who regularly uses mindfulness. But after a couple minutes, it became enjoyable. Peaceful, even. Because my attention wasn't split, I was able to completely focus on the here and now. I noticed the differences between the hot chicken and the cool sour cream. I heard the music playing, and paid attention to how my body felt sitting on the stool. I became aware of my mood changing. What is one thing you can do mindfully today? Maybe you've been practicing mindfulness and are ready to take it to the next level. I regularly incorporate mindfulness practices into counseling for anxiety and depression. Schedule an appointment to get started today. What comes to mind when you think of Valentine's Day? There are so many perspectives! Some of us go all out with treats and decorations, while others of us attend Singles Awareness Day parties. Some of us are disinterested in the commercialization of love, and others find it charming to dedicate a whole day to the idea. Whatever your thoughts on Valentine's Day, I am challenging you to take another perspective. What if you could decide it was a day to practice self-love? What if you declared a cease-fire on all that negative self-talk? What if you stopped the hustle, and allowed yourself to just be where you are? It might feel self-indulgent, decadent even, to take this time just for yourself. But, a gentle reminder: you cannot give to others what you yourself do not have. If you truly want to give love to others, you must first love yourself. 1. Take yourself out on a date! This is so important, regardless of your relationship status. Really sit down and think about what you'd like to do- what makes you feel fully alive? What do you value? For example, my idea of a great self-date is going over to the Minneapolis Institute of Art and then having coffee at Spyhouse. Just thinking about it makes me excited! 2. Give yourself permission to re-evaluate some friendships. Some people come into our lives for seasons, and others are around longer. Are you holding onto some friendships just for the sake of longevity? If a relationship is toxic (read: you feel worse after spending time with this person), it's time to take a good long look at your reasons for staying. 3. Practice yoga! It's no secret that yoga is wonderful for your mind and body. But sometimes it can feel painful to be in savasana when that to-do list is racing through your mind. Lean into that discomfort. Notice what feelings emerge. Allow yourself to tend to your mind and body during a solo yoga practice. 4. Write down your thoughts. Even a few moments of journaling can be eye-opening. The act of putting your thoughts down on paper forces you to slow down. This way you can really notice the quality of your thought life. Is your inner voice is more critical or compassionate? 5. Start prioritizing your mental health and make an appointment with a counselor. You don't need to be experiencing a crisis to benefit from counseling. Think of it like preventive maintenance, or going in for an annual physical! Dreamy candlelit dinners and cozy nights with family around the fire. Leisurely shopping trips, delightful conversations with relatives, beautifully wrapped gifts. Is this how you picture the holiday season? I have a tendency to romanticize seasons and holidays. (Oh, won't it be lovely when the ground is covered in a blanket of magical snow and frost is on all the trees and we'll be drinking hot cocoa and wearing cozy sweaters all the time?!) Then reality hits me like a ton of bricks when my car is sliding all over the interstate in said magical snow and my life is flashing before my eyes. There's nothing wrong with looking forward to the holiday season. But it can become problematic when our expectations are way out of line with reality- when perfectionism takes over. Perfectionism tells you that you must create the idyllic holiday season for yourself and everyone in your life- from attending every festive event in your city, to decorating your home perfectly to impress your holiday party guests. Perfectionism during the holidays can rob your sense of peace. 1. Do a little reality-checking. When you catch yourself fantasizing about how perfect this holiday season will be, ask yourself if it's possible you're fantasizing about a Norman Rockwell painting rather than being honest about your actual circumstances. 2. Notice if you're putting unrealistic expectations on family members. Unpleasant family dynamics don't magically go away just because it's Christmas. In fact, some issues will appear magnified with a busier schedule and more family gatherings. Instead, focus on yourself- your own words and actions- not on what other people might say or do. Realize that what your Uncle Scott says over Christmas dinner might be super offensive- and that is has nothing to do with you. 3. Reflect on how much time and effort you're putting into making the holiday season just right. It's easy to get caught up in all the parties and gatherings, but what if you could inject some of that enthusiasm and magical feeling into your everyday life? Here in the Twin Cities, frigid temperatures and snow last at least through March. I've mentioned before how important it is to plan something exciting during the darker, frozen months. Whether it's embracing the cold by going ice skating, or chasing the sun for a beach vacation in the middle of February, be intentional about your winter activities post-holiday season. It'll take the pressure off these precious few weeks. Above all, give yourself grace. When something doesn't go according to your holiday plans (and something will), treat yourself like you would someone you love. Be kind and compassionate to yourself. In a season devoted to joy and peace, give yourself the gift of self-love. Is perfectionism making it harder for you to enjoy the holiday season? Counseling can help you learn to recognize and respond to the voice of perfectionism. Schedule an appointment to get started today. Be mindful of your new spouse's experience. The traditions you and your siblings have done for the past 20 years may end up alienating your spouse. Consider how your spouse might be feeling- especially if s/he is spending the holidays away from family for the first time. Have a conversation as a couple before the family gatherings so you both can better understand each other's experiences and emotions. Back in college, I was in a sorority- an institution where traditions abound! But some of them had completely lost their meaning, and we were just going through the motions because it was what we had always done. These things were taking up a lot of our time, and the payoff just wasn't there. Take some time to examine what you are doing and why. If a tradition no longer serves your family, it's okay to stop doing it. Meaningful traditions have to start somewhere- who knows, if you and your new husband start a new tradition of bringing cookies to your neighbors, your future children may find themselves doing the same with their future spouses and children. Have fun with this idea of creating something new! How are you feeling about your first holiday season as a married couple? It's normal to be feeling a mixture of emotions- anxious, eager, excited, overwhelmed, sad. If you're having a hard time managing your emotions, consider making a counseling appointment. Schedule your first appointment to get started today. It's so easy to become overwhelmed this time of year. Believe it or not, it is possible to go through Thanksgiving, Christmas, and the New Year with a true sense of joy, love, and peace. Read on for some practical tips! Consider a mindset shift on gifts. Studies show that experiences, not material things, make us happier. Think back to Christmas last year- can you remember the gifts you received? Do you remember the gatherings or parties? How much time are you spending planning, purchasing, and wrapping gifts? Give yourself permission to decline invitations. It's okay to say "no" to holiday parties. I'm going to say it again. It's okay to say "no" to holiday parties. Work parties, gatherings with friends, family events- you don't need to go to all of them. Just recently, I heard someone mention how she will be attending Christmas parties every Friday and Saturday starting Thanksgiving weekend until the New Year. That is 5 straight weekends of holiday parties. Now, some might really be able to handle all of that. But I would wager that most of us would be completely overwhelmed with that type of schedule. It's okay to pick and choose which events you attend- you are in charge of your time. Scale back on the decorations. Research shows the connection between a cluttered space and a cluttered mind. Keeping your home neat plays a big part in feeling like you can manage the stress of the holiday season. How do you normally deck the halls? Are there knick-knacks in every room? Stockings, a tree, wreath, garland? If decorating feels overwhelming and adds to your stress, don't do it. Or, what about keeping it simple this year with just a tree and some white lights? Really, it's okay! Beware of Pinterest. I will be the first one to say that I love using Pinterest- I love using it to look up new recipes, fashion ideas, and find travel inspiration. At the same time, I'm weary of comparing my own life to one that is more Pinteresting- especially when it comes to the holiday season. Beautifully decorated mantles, perfect Christmas cookies, and charmingly styled family photos are everywhere. These things aren't necessarily bad- but once we start comparing, and thinking those "not good enough" thoughts, the shame spiral begins, anxiety creeps up, and quickly a festive season becomes stressful. Anxiety has a knack for taking over lives- especially during this time of year. Family gatherings, gifts, and expectations can all be anxiety triggers. If you're tired of anxiety ruling your life, counseling can help. We can work together to manage it during the holiday season and beyond. Schedule an appointment to get started today. 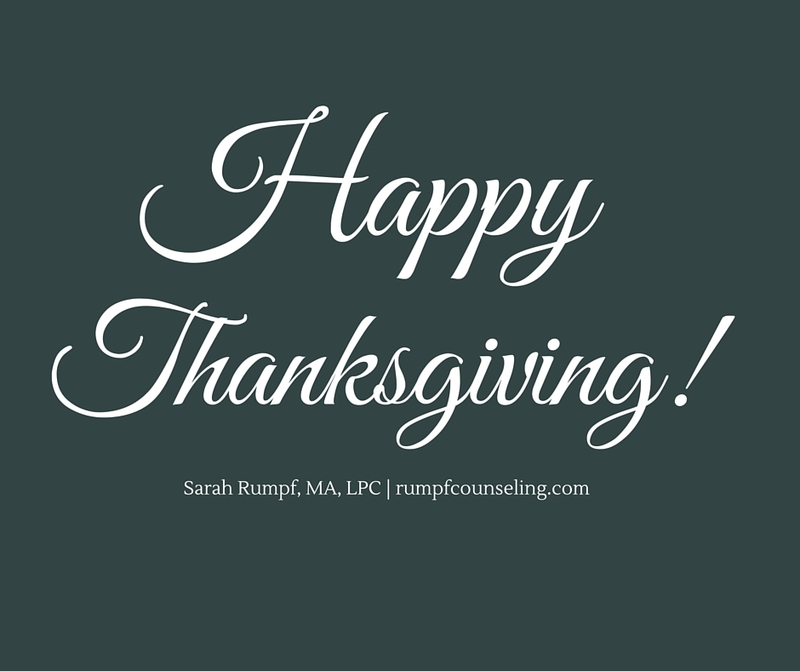 Thanksgiving is a day dedicated to giving thanks- showing appreciation and gratitude for our blessings. But many times, other things take center stage- things like turkey, cranberries, and football. Yes, those are good things- but they aren't the core of Thanksgiving. If you are struggling with anxiety or depression, or having trouble with the recent time change, I have good news- practicing gratitude is great for your mental health, it doesn't take much time, and it's free! Studies have shown the positive effects of gratitude, including increased optimism, decreased depression and aggression, increased self-esteem, improved motivation, and healthier relationships. As you prepare for your Thanksgiving celebration, take some time to consider the good parts about your life. This is not being dismissive of the very real and difficult parts. On the contrary, it is a practice of seeing through the negative into the positive. Every night for the next week, set aside ten minutes before you go to sleep. Write down three things that went well today and why they went well. You may use a journal or your computer to write about the events, but it is important that you have a physical record of what you wrote. The three things need not be earthshaking in importance (“My husband picked up my favorite ice cream for dessert on the way home from work today”), but they can be important (“My sister just gave birth to a healthy baby boy”). So here is my challenge for you- try this gratitude practice each night leading up to Thanksgiving. Notice how you feel as you begin, and how you feel in the days getting close to the holiday. When Thanksgiving arrives, notice where your attention goes and what is taking up space in your mind. My guess is that although the hustle and bustle of the celebration will still be there, you will feel more at peace, less anxious, and sincerely grateful for the blessings in your life.